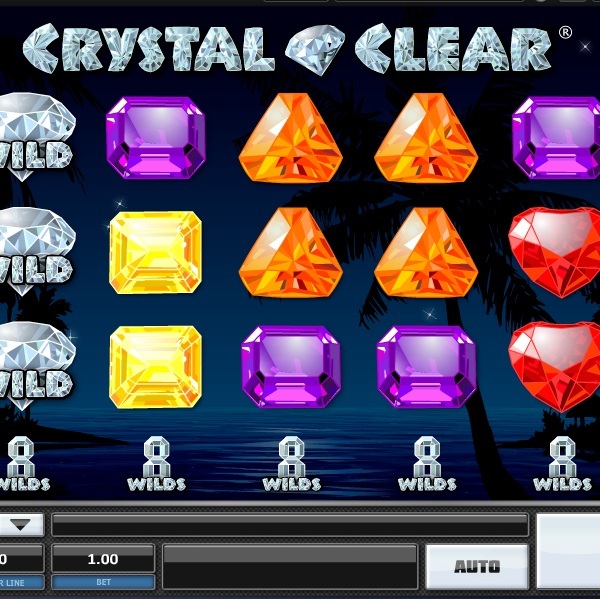 If you like shiny gems then take a look at the new Crystal Clear slot which has been released by Realistic Games. It is a 5 reel slot with 10 fixed paylines. The reels are transparent and there is a tropical scene in the background. There are six gems of different colour on the reels: red, blue, purple, green, orange and yellow. The wild symbol is a clear diamond and it can substitute for all other symbols. At the beginning of each spin there is a stack of eight wilds on each reel. Each time you spin a win all non-wild symbols on that combo change into wilds and you receive a free re-spin. With each successive win the process continues until there are no more wins or you hit the jackpot of 10,000x for five wilds.